In fire, concrete performs well – both as an engineered structure, and as a material in its own right. It has the highest fire resistance classification (class AI) under EN 13501-1:2007- A1:2009. In most cases, concrete does not require any additional fire-protection because of its built-in resistance to fire. It is a non-combustible material (i.e. it does not burn), and has a slow rate of heat transfer. Concrete ensures that structural integrity remains, fire compartmentation is not compromised and shielding from heat can be relied upon. Because of concrete’s inherent material properties, it can be used to minimise fire risk for the lowest initial cost while requiring the least in terms of ongoing maintenance. Other materials rely on fire protection, fire safety engineering or rate of loss of combustion. This reliance on fire protection, fire safety engineering and rate of combustion makes them unforgiving of workmanship errors, future changes as simple as changing light fittings, compliance with management procedures and human behaviour. Concrete does not burn – it cannot be set on fire and it does not emit any toxic fumes when affected by fire. Concrete is proven to have a high degree of fire resistance and, in the majority of applications, can be described as virtually fireproof. This excellent performance is due, in the main, to concrete’s constituent materials (cement and aggregates) which, when chemically combined within concrete, form a material that is essentially inert and, importantly for fire safety design, has relatively poor thermal conductivity. It is this slow rate of conductivity (heat transfer) that enables concrete to act as an effective fire shield not only between adjacent spaces, but also to protect itself from fire damage. Concrete structures perform well in fire. This is because of the combination of the inherent properties of the concrete itself, along with the appropriate design of the structural elements to give the required fire performance and the design of the overall structure to ensure robustness. Fire performance is the ability of a particular structural element (as opposed to any particular building material) to fulfil its designed function for a period of time in the event of a fire. The impact of a major fire at Tytherington County High School, Cheshire, was limited due to the fire resistance of the concrete structure. Rather than taking a year to be demolished and replaced, as was the case with an adjacent lightweight structure, the concrete classrooms were repaired ready for the following term. 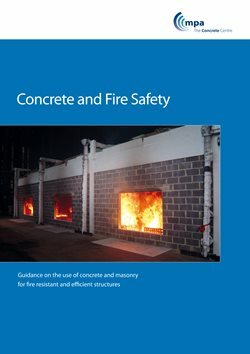 For detailed guidance on concrete and fire, visit the publications library to purchase the publication Performance of Concrete Structures in Fire. RIBA Proposed "Fire Plan of Work"